For the book by Ben Kiernan, see Blood and Soil (book). Blood and soil (German: Blut und Boden) is a nationalist slogan expressing Nazi Germany's ideal of a "racially" defined national body ("blood") united with a settlement area ("soil"). By it, rural and farm life forms are not only idealized as a counterweight to urban ones, but they are also associated with an imaginary and sedentary Germanic-Nordic peasantry which is placed in opposition to an anti-Semitic trope of Jewish nomadism. It is tied to the contemporaneous German concept of Lebensraum, the belief that the German people needed to reclaim historically German areas of Eastern Europe into which they could expand. "Blood and soil" was a key slogan of National Socialist (Nazi) ideology. The nationalist ideology of the Artaman League and the writings of Richard Walther Darré guided agricultural policies which were later adopted by Adolf Hitler, Heinrich Himmler and Baldur von Schirach. The German expression was coined in the late 19th century, in tracts espousing racialism/racism and romantic nationalism. It produced a regionalist literature, with some social criticism. This romantic attachment was widespread prior to the rise of the Nazis. Major figures in 19th-century German agrarian romanticism included Ernst Moritz Arndt and Wilhelm Heinrich Riehl, who argued that the peasantry represented the foundation of the German people and conservatism. Ultranationalists predating the Nazis often supported country living as more healthy, with the Artaman League sending urban children to the countryside to work in part in hopes of transforming them into Wehrbauern (lit. "soldier peasants"). Richard Walther Darré popularized the phrase at the time of the rise of Nazi Germany; he wrote a book called Neuadel aus Blut und Boden (A New Nobility Based On Blood And Soil) in 1930, which proposed a systematic eugenics program, arguing for selective breeding as a cure-all for the problems plaguing the state. In 1928, he had also written the book Peasantry as the Life Source of the Nordic Race, in which he presented his theory that the alleged difference between Nordic people and Southeastern Europeans was based in the Nordic people’s connection to superior land. Darré was an influential member of the Nazi Party and a noted race theorist who assisted the party greatly in gaining support among common Germans outside the cities. Prior to their ascension to power, Nazis called for a return from the cities to the countryside. This agrarian sentiment allowed opposition to both the middle class and the aristocracy, and presented the farmer as a superior figure beside the moral swamp of the city (and thus gentile Germans as superior to Jews). It contributed to the Nazi ideal of a woman: a sturdy, Christian peasant, who worked the land and bore strong children, contributing to praise for athletic women tanned by outdoor work. That country women gave birth to more children than city ones was also a factor in the support. Carl Schmitt argued that a people would develop laws appropriate to its "blood and soil" because authenticity required loyalty to the Volk over abstract universals. The program received far more ideological and propaganda support than concrete changes. When Gottfried Feder tried to settle workers in villages about decentralized factories, generals and Junkers successfully opposed him. Generals objected because it interfered with rearmament, and Junkers because it would prevent their exploiting their estates for the international market. It would also require the breakup of Junker estates for independent farmers, which was not implemented. The Reichserbhofgesetz, the State Hereditary Farm Law of 1933, implemented this ideology, stating that its aim was to: "preserve the farming community as the blood-source of the German people" (Das Bauerntum als Blutquelle des deutschen Volkes erhalten). Selected lands were declared hereditary and could not be mortgaged or alienated, and only these farmers were entitled to call themselves Bauern or "farmer peasant", a term the Nazis attempted to refurbish from a neutral or even pejorative to a positive term. Regional custom was only allowed to decide whether the eldest or the youngest son was to be the heir. In areas where no particular custom prevailed, the youngest son was to be the heir. Still, the eldest son inherited the farm, in most cases, during the Nazi era Priority was given to the patriline, so that, if there were no sons, the brothers and brothers' sons of the deceased peasant had precedence over the peasant's own daughters. The countryside was also regarded as the best place to raise infantry, and as having an organic harmony between landowner and peasant, unlike the "race chaos" of the industrial cities. It also prevented Jews from farming: "Only those of German blood may be farmers." The concept was a factor in the requirement of a year of land service for members of Hitler Youth and the League of German Girls. This period of compulsory service was required after completion of a student's basic education, before he or she could engage in advanced studies or become employed. Although working on a farm was not the only approved form of service, it was a common one; the aim was to bring young people back from the cities, in the hope that they would, then, stay "on the land". In 1942, 600,000 boys and 1.4 million girls were sent to help bringing in the harvest. The concept was one of the reasons for the creation of the Reich Harvest Thanksgiving Festival whose main purpose was the recognition of the achievements of the German farmers (as well as the propagation of nationalist, anti-Semitic ideologies). Blood and soil was one of the foundations of the concept of Lebensraum, "living space". By expanding eastward and transforming those lands into breadbaskets, another blockade, such as that of World War I, would not cause massive food shortages, as that one had, a factor that aided the resonance of "Blood and soil" for the German population. Even Alfred Rosenberg, not hostile to the Slavs as such, regarded their removal from this land, where Germans had once lived, as necessary because of the unity of blood and soil. Mein Kampf prescribed as the unvarying aim of foreign policy the necessity of obtaining land and soil for the German people (again, "German people" defined by the Nazi Party as Christian Aryans). 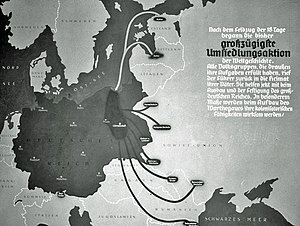 While discussing the question of Lebensraum to the east, Hitler envisioned a Ukrainian "breadbasket" and expressed particular hostility to its "Russian" cities as hotbeds of Russianness and Communism, forbidding Germans to live in them and declaring that they should be destroyed in the war. Even during the war itself, Hitler gave orders that Leningrad was to be razed with no consideration given for the survival and feeding of its population. This also called for industry to die off in these regions. The Wehrbauer, or soldier-peasants, who were to settle there were not to marry townswomen, but only peasant women who had not lived in towns. This would also encourage large families. Furthermore, this land, held by "tough peasant races", would serve as a bulwark against attack from Asia. Prior to the Nazi take-over, two popular genres were the Heimat-Roman, or regional novel, and Schollen-Roman, or novel of the soil, which was also known as Blut-und-Boden. This literature was vastly increased, the term being contracted into a slogan "Blu-Bo", and developed a mysticism of unity. It also combined war literature with the figure of the soldier-peasant, uncontaminated by the city. These books were generally set in the nominal past, but their invocation of the passing of the seasons often gave them an air of timelessness. "Blood and soil" novels and theater celebrated the (Christian, Aryan) farmer's life and their fertility, often mystically linking them. One of the anti-Semitic fabrications in the children's book Der Giftpilz was the claim that the Talmud described farming as the most lowly of occupations. It also included an account of a Jewish financier forcing a German to sell his farm as seen by a neighbor boy; deeply distressed, the boy resolved never to let a Jew into his house, for which his father praised him, on the grounds that peasants must remember that Jews will always take their land. During the Nazi period in Germany, one of the charges put forward against certain works of art was that "Art must not be isolated from blood and soil." Failure to meet this standard resulted in the attachment of the label, "degenerate art", to offending pieces. In Nazi art, both landscape paintings and figures reflected blood-and-soil ideology. Indeed, some Nazi art exhibits were explicitly titled "Blood and Soil". Artists frequently gave otherwise apolitical paintings such titles as "German Land" or "German Oak". Rural themes were heavily favored in painting. Landscape paintings were featured most heavily in the Greater German Art Exhibitions. While drawing on German romantic traditions, painted landscapes were expected to be firmly based on real landscapes, the German people's Lebensraum, without religious overtones (other than the implicit suggestion that "the German people" excluded German Jews). Peasants were also popular images, promoting a simple life in harmony with nature. This art showed no sign of the mechanization of farm work. The farmer labored by hand, with effort and struggle. The acceptance of this art by the peasant family was also regarded as an important element. 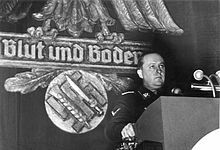 Under Richard Walther Darré, The Staff Office of Agriculture produced the alleged documentary (propaganda film) Blut und Boden, which was displayed at Nazi party meetings as well as in public cinemas throughout Germany. Other Blut und Boden films likewise stressed the commonality of Germanness and the countryside. Die goldene Stadt has the heroine running away to the city, resulting in her pregnancy and abandonment; she drowns herself, and her last words beg her father to forgive her for not loving the countryside as he did. The film Ewiger Wald (The Eternal Forest) depicted the forest as being beyond the vicissitudes of history, and the German people the same because they were rooted in the story; it depicted the forest sheltering ancient (white, Aryan) Germans, Arminius, and the Teutonic Knights, facing the peasants wars, being chopped up by war and industry, and being humiliated by occupation with black soldiers, but culminated in a neo-pagan May Day celebration. In Die Reise nach Tilsit, the Polish seductress is portrayed as an obvious product of "asphalt culture," but the virtuous German wife is a country dweller in traditional costume. Many other commercial films of the Nazi era featured gratuitous, lingering shots of the Nazi landscape and idealized Aryan couples. An Investigation of Global Policy with the Yamato Race as Nucleus made extensive use of the term, usually in quotation marks, and showing an extensive debt to the Nazi usage. North American white supremacists, white nationalists, Neo-Nazis and members of the alt-right have adopted the slogan. It gained widespread public prominence as a result of the August 2017 Unite the Right rally in Charlottesville, Virginia, when participants carrying torches marched on the University of Virginia campus on the night of 11 August 2017 and were recorded chanting the slogan, among others. The rally was organized to protest the town's planned removal of a statue of Robert E. Lee. The rally remained in national news through December 2018 thanks to the trial of James Alex Field, a white supremacist who purposefully ran his car into a crowd of counter-protestors, killing 32-year old paralegal Heather Heyer. The chant was also heard in October 2017 at the "White Lives Matter" rally in Shelbyville, Tennessee. ^ a b Robert Cecil, The Myth of the Master Race: Alfred Rosenberg and Nazi Ideology p165 ISBN 0-396-06577-5. Marie-Luise Heuser, Was Grün begann endete blutigrot. Von der Naturromantik zu den Reagrarisierungs- und Entvölkerungsplänen der SA und SS, in: Dieter Hassenpflug (Hrsg. ), Industrialismus und Ökoromantik. Geschichte und Perspektiven der Ökologisierung, Wiesbaden 1991, S. 43-62, ISBN 3-8244-4077-6. ^ Gustavo Corni, “Richard Walther Darré: The Blood and Soil Ideologue,” in Ronald Smelser and Rainer Zitelman, eds., The Nazi Elite (New York: New York University Press, 1993), 19. ^ David Schoenbaum, Hitler's Social Revolution: Class and Status in Nazi Germany, 1933-1939, p 161-2 Garden City, NY Doubleday, 1966. ^ a b "Blood & Soil: Blut und Boden[permanent dead link]"
^ "Not Empty Phrases, but Rather Clarity Archived 2011-09-29 at the Wayback Machine"
^ "Nazi Racial School Charts Archived 2011-07-16 at Wikiwix"
^ "Nazi anti-Semitic Catechism Archived 2011-06-08 at the Wayback Machine"
^ webmaster@verfassungen.de. "Reichserbhofgesetz (1933)". www.verfassungen.de. Archived from the original on 18 October 2017. Retrieved 4 May 2018. ^ Galbraith, J. K. (1939). "Hereditary Land in the Third Reich". The Quarterly Journal of Economics. 53 (3): 465. doi:10.2307/1884418. JSTOR 1884418. ^ Bytwerk, Randall. "Hitler Youth Handbook". www.calvin.edu. Archived from the original on 10 April 2014. Retrieved 4 May 2018. ^ "What is the Talmud? Archived 2011-05-14 at the Wayback Machine"
^ "How a German Peasant Was Driven from House and Farm Archived 2010-10-20 at the Wayback Machine"
^ David Welch, Propaganda and the German Cinema, 1933-1945 (London: I.B. Tauris Publishers, 1983), 84. ^ CNN, Meg Wagner. "'Blood and soil': Protesters chant Nazi slogan in Charlottesville". CNN.com. Archived from the original on 2017-08-13. Retrieved 2017-08-14. ^ Hansen, Lauren. "48 hours in Charlottesville: A visual timeline of Charlottesville's harrowing weekend of violence". THE WEEK. Archived from the original on 26 August 2017. Retrieved 26 August 2017. ^ James, Mike (7 December 2018). "Neo-Nazi convicted of murder in Charlottesville car assault that killed Heather Heyer". USA Today. Retrieved 28 February 2019. ^ Tamburin, Adam; Wadhwani, Anita (28 October 2017). "Murfreesboro rally canceled as counterprotesters outnumber White Lives Matter activists". The Tennessean. Retrieved 29 October 2017. Wikimedia Commons has media related to Blood and Soil.